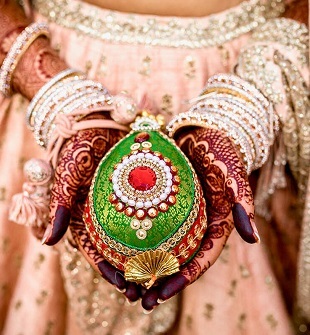 India, being a super rich country in culture and heritage, has innumerable traditions and customs when it comes to weddings and most of which exist only in India. 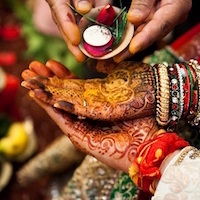 Right from deciding the date of the wedding– unlike the rest of the world, we let stars and planets decide the Holy date which ensures a prosperous time for the wedding to Henna filled hands. If you’re looking forward to a lot of photographs and selfies full of smiles at your wedding, be grateful you’re not living in Congo for this particular reason that the bride and groom are not allowed to smile on their wedding day. Why, you ask? If they do, it would apparently mean that they are not serious about their marriage. The brides and grooms in France have to eat chocolate along with champagne after the wedding reception. Seems normal right? Well, not if I told you they have to eat the chocolates from a toilet bowl. The point here is to give the two strength for their wedding night (I just don’t see how that would give strength). If you go to a Japanese wedding and see a thousand cranes as decor, don’t be surprised. The cranes have special significance in Japan, as these creatures mate for life and symbolise love. So, paper cranes are a custom they hold dear to be blessed with a long and happy marriage. Also, the bride has to wear white from head to toe- including the makeup, kimono and hood. White symbolises her maiden status and the hood hides the ‘horns of jealousy’ she feels towards her mother-in-law. Planning to ask your girlfriend’s father her hand in marriage? Well quick, get that whale’s tooth ready. Oh wait, this happens only in Fiji. This marks as a show of respect and to show that he will treat the man’s daughter well. It also shows that the son-in-law has a high status. Just FYI, the whales are not killed for their teeth. The ‘tabua’ is taken from the lower jaws of sperm whales found dead on the beach. Unlike the brides of the rest of the world, trying to stick to a diet and healthy routine to lose those extra pounds to fit into THE dress, Mauritius brides-to-be are served like a king before their wedding to gain extra pounds as it would be better for the husband who would be thought to be wealthy with such a well-fed wife. Only if we had this tradition in every part of the world, sigh! Couples in Germany short after they say their I dos to each other, are faced with an activity of sawing a log which represents the obstacles they may face in their married life and sort them together as a couple. They also clean up piles of porcelain dishes that the guests throw on the ground to shut off any evil spirits. If you think the baby-matter is high only in India, listen to this. An infant is placed on the couple’s bed before the ceremony for higher and enhanced chances of fertility. Not only this, once they’re married, guests shower them with peas and rice, again to enhance fertility. It is considered good luck for the newlyweds to sneak away before the after party is over, and without getting caught. Now, this is my favourite tradition so far. Bonus, it saves so many awkward conversations too. Way to go, Venezuela! Talking of crazy wedding traditions, for setting a wedding date, Mongolian couple first have to kill a baby chicken and cut it holding a knife together, to find its liver. Hmm, that is something. As per the customs, when the bride and groom are dancing together, the bride must keep her feet on the ground at all times. Otherwise, it is believed that evil fairies come and take her away. 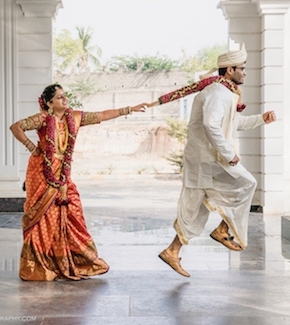 So these were some of the most interesting wedding traditions around the globe. If you think we’re missing out on a crazy one, be sure to let us know in the comments. Lots of love!